Machame route climbing guide. Duration: Six days, five nights, you spend the night in tents. To / from: Machame Gate (1500m) – Machame Camp (3000 meters). Duration: 6 to 7 hours, 18 km. Depending on your arrival, you will leave early morning and drive by car / bus to the starting point, which in this case Machame Gate Park. The climb takes you through the tropical rainforest at the foot of Mount Kilimanjaro, you will see the necessary tropical birds, monkeys including the colobus monkey and other animals, the first climb is long but easy. Overnight at the Machame Camp. To / from: Machame Camp (3000 meters) – Shira Camp (3700 meters). Duration: 5 to 6 hours, 9 km. 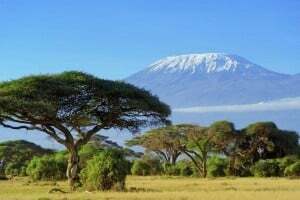 Leaving the tropical rainforest, and runs through the steppes up, over time, the steppes change into a rocky landscape, with volcanic rocks and cacti, you will see during the climb all the snow-capped peak of Mount Kilimanjaro. Overnight at Shira Camp. To / from: Shira Camp (3700 meters) – Lava Tower (4630 meters) – Barranco Camp (3940 meters). Duration: 7 hours, 15 km. The walk takes you past the Lava Tower, this is a rocky outcrop about a hundred meters, also known as the Shark Tooth, here you lunch. The path to the top is steep and the climb becomes heavier, normally the first symptoms of altitude sickness here noticeable. From the Lava Tower, you descend to the Barranco Camp where you spend the night. If you have opted for an extra acclimatization you can do this here. From / to Barranco Camp (3940 meters) – Barafu Camp (4680 meters). Duration: 6 to 7 hours, 13 km. You climb through a steep rocky path up through the Barranco wall, the views here are amazing, you pass the Karanga Valley where the last water point, save enough water here, and try at least to keep a thermos with spring water freezes at these heights the water. Arriving at the Barafu camp (Barafu is the Swahili word for ice cream), save your tents. Explore the surroundings are good because a few deep ravines are here. Make sure your bag / headlamp battery has enough power, so if you go to the toilet must not suddenly come to stand in the dark. Go at seven o’clock to bed, to get the necessary precious hours of sleep. From / to Barafu Camp (4680 meters) – Uhuru Peak (5895 m, top) – Mweka Camp (2800 meters). 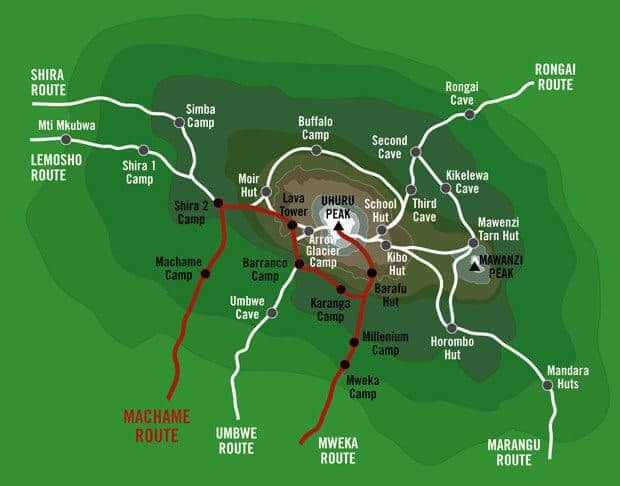 Duration: Barafu Camp – Uhuru Peak, 5 to 6 hours – Uhuru Peak – Mweka Camp 4 to 5 hours. You leave around midnight for the climb to Stella Point (5 to 6 hours), which will see an unforgettable sunrise, hereafter you climb to Uhuru Peak (1 to 2 hours) (highest peak in Africa at 5,895 meters), the trip to the top takes about six to seven hours, then you go down to Mweka Camp at 2800 meters, it takes about four to five hours. This part of the climb is by far the hardest. From / to Mweka Camp (2800 meters) – Mweka Gate (1400 meters). You descend from Mweka Camp to Park Gate, and from here you will be returned to Moshi or Arusha, where a refreshing swim in the pool, or take a hot shower.